Location of the Department: campus №2, 3 floor, room № 308, 309, 302, 312. Department of Information Technology is an independent structural unit of the Republican State Enterprise on the right of economic management “Kazakh National Medical University. S.D. Asfendiyarov “( after referred to as the University). The Department of Information Technology is directly subordinate to the Executive Vice-Rector of the University. The Department of Information Technologies carries out the development and implementation of programs and action plans for the informatization of the university. Objectives, tasks, functions the main directions of the Department of Information Technology. – ensuring the security of the functioning of the information and telecommunications infrastructure, information and telecommunications systems. The composition of the department. Kalenova Bakytgul Sovetovna – Head of the Department of Information Technology, candidate of physico-mathematical Science, docent. In 1986 she graduated from the Kazakh State University named after SM. Kirov (now KazNU named after al-Farabi) in the specialty “Mechanics” with the qualification “Mathematician-Applicant”. After graduating in 1997 she defended her thesis. The experience of scientific and pedagogical activity is 30 years. 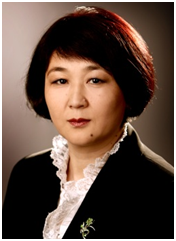 For more than 30 years of work in the universities of the Republic of Kazakhstan, she held various positions: senior lecturer, associate professor, head of the department, dean of the faculty, director of the Center for Innovative Technologies and Library and Information Complex, pro-rector for educational and methodological work, director of the Internal Audit Department, Head of the Department information technologies. Kalenova B.S. studied the experience of foreign universities Germany (Munich), South Korea (Seoul), Mongolia (Ulan Bator), France (Paris). The gained experience is used in the development and implementation of projects to create a unified information and educational environment for higher education institutions, within the university system to ensure the quality of education, to introduce the parameters of the Bologna process and to organize events to promote the university in the international QS rating. She published more than 100 scientific and scientific-methodical works: manuals, articles in national and international publications, including with impact factor, in co-authorship, standard curriculums on the specialty “Information systems”, author’s certificates for objects of intellectual property (computer programs – automated information system, electronic textbooks, etc.) were obtained. Participated in the development and implementation of state budget and economic contracts (design of the information system) of scientific topics. Her contribution to the development of education and science in higher education institutions was marked by state awards – the badge “Honorary Worker of Education of the Republic of Kazakhstan” (2014), the jubilee medal “The 20th anniversary of Independence of the Republic of Kazakhstan” (2011), Diplomas of Honor (2001, 2005). and the Letter of Thanks (2007) of the Ministry of Education and Science of the Republic of Kazakhstan, as well as the jubilee badges of universities (2001, 2007, 2012) and thanksgiving letters from the leadership of universities and local executive bodies. Zhansarov Yerkebulan Aibekovich – head of the Department of service-technical support.